The universe conspired to make my last session a clinic on game selection. I arrived at Rivers Casino determined to redeem myself after losing nearly three buy-ins, or about a third of my bankroll, in the previous session. I ended up losing a little over one buy-in. On the gentle valley of this generally precipitous downswing, what did I learn in exchange for my admission fee? If I’m going to take this game seriously, and approach it like a professional, game selection is serious business. I am not a big believer in “The Universe” and its cosmic ability to illustrate important life lessons through a confluence of uncanny coincidence. But in retrospect, the session as a whole tended toward a comic illustration of why game selection is everything when it comes to winning poker. My session was a game selection sandwich where I chose to remain in the tough, meaty middle for most of my session, instead of partaking in the fluffy first and last tables I was seated at. The first area I went wrong was with the conclusions I drew while listening to the Spotting Live Poker Pros podcast. Don’t get me wrong, it’s full of great advice and was a huge motivator in understanding that one must eventually tangle with the other best players at your table to play an optimal strategy. James “SplitSuit” Sweeney illustrates this concept beautifully in his article about eliminating the second-best player at your table. The idea is that we want to be going toe-to-toe with our biggest competition on the table in order to shut them down and siphon the profits of aggression and strategic cunning to our stack. And it doesn’t hurt that playing the best players makes us better because it forces us to study and play our A game. In this latest session, I learned an important lesson pursuant to the last Strategy in Action about always having a professional mindset in approaching the table. Taking on the best player at the table was one thing. Game selection was entirely another thing. And I was flouting all common sense to prove my poker worth. I should have been game selecting from the start. Was I lulled into a false sense of security at the Rivers Casino after experiencing almost universally soft competition at the Sands? Was this just another mental game leak, which seems to be all I’ve been working on lately? Those are certainly contributing factors. Mostly, I was too caught up in the idea that I can — no, should — play at tables with players who were as good or better than me. It was good practice, good training. It pushed me to play my A game. There were many reasons. I don’t thing they added up to as much as I was giving them credit for. But at the end of the day, the professional poker mindset dictates long-term profit is a priority above pretty much all else. And game selection was the biggest factor I was ignoring, even flouting, with my naive insistence on staying at tables that felt hard, not soft. Get ready for the face-palm, game selectors. Those who aren’t requesting table changes often enough (like me, circa this session), listen up. As has been custom the last few sessions, I try to sit at a table with my poker buddy Rachael. Sometimes we get sat at the same table immediately, other times one of us is moved after 15-20 minutes. This time around, I was first sat at a table full of average-looking people playing average-sized stacks. In the first hand there were 5 limpers, I folded 8-4 offsuit on the button, both blinds called. The hand checked all the way down to a river of A8426… seven ways. A pair of sevens that limped in early position took it down. I was licking my lips. And then I was called to the nightmare table with my friend. The guy to my left was the most reg a reg could be, talking with dealers and other players like they went back years. Keep in mind, this casino just opened a couple months ago. He was sitting on a stack of $600 and was playing tight but tricky, with big open raises and unrelenting aggression. Directly to my left, I had a solid, aggressive player. But that was nothing compared to the 3-seat, who sat on a stack of about $1000, piled into massive $200 tiers of red stacks. This guy was limp-calling and limp-re-raising, 3-betting to isolate, opening to pain threshold sizes, making lots of calculated plays and clearly knew what he was doing. The player to his left, though short-stacked at $150, was playing well too. The rest of the players, while not remarkable, were not remarkably bad either. Long story short, I dumped almost two buyins over two hours at this table, first doubling up the savvy short stack when I ran my two pair into his set, and then pushing most of a stack to the $1K player when he raised my top pair top kicker all-in on the turn, and I got blasted off a super-coordinated board. The other players weren’t bad either. Everyone else was playing the game well. Everyone who wasn’t on a dinner break. Most of the time the action was 7-handed, and I was mixing it up with the good players on the regular. This was the opposite of shooting fish in a barrel. This was a shark fight. My poker buddy and I broke for dinner and gave up our seats, frustrated with the action at the table. I was particularly fixated on that first table and feeling like I should have stayed. It was, as SplitSuit would say, a “marshmallow pit“. The $1/$2 game we got sat down into upon our return made the marshmallow pit look like Bobby’s Room. Glancing at the display on the table, I noticed two players marked as ‘Guest’. This is an immediate tell that puts a bullseye on unstudied, inexperienced players. Rarely is this played as an angle. Both players clearly knew each other but were going out of their way not to appear like they were friends or colluding, another tell that they were amateurs. But all the tells were unnecessary when they each started raising pre-flop to $4 and $5. Every player at the table was in a hand with these guys. They folded almost everything. When they continued with any aggression whatsoever, it was like a bomb scare. The table emptied out. These small pots they won, where they left untold riches on the table, appeared very outwardly satisfying to them. It was textbook unstudied player syndrome. If this pair was a dream come true, the rest of the table was perfectly acceptable from a game selection perspective. No monster stacks pushing people around, no highly skilled players pulling complicated moves. There were a couple of skilled regs, to be sure, but the rest of the table were your average loose pre-flop, fit-or-fold post-flop, came-to-win-pots recreational players. Within an hour I cut half my losses. My aggressive moves were getting through, and when I was challenged, I could easily put opponents on tight ranges and play well post-flop. No hand was boring because every one had the potential to either exploit the mistakes of others, or simply observe them for future exploitation. I was well on my way to being table captain within the first few orbits. I had to be sitting at the best poker table in the casino right now. Hell, this was the softest game I had sat in all year. Less than an hour later, just after a single orbit where I picked up AJ, AQ and AK, winning 3 out of 3, it was time to go. But not before I dumped the $150 I had just won back to my poker buddy when she slow-played a set against my two pair! This episode, I was left with a clear lesson: If long-term profit was still my goal, game selection had to be part of the overall strategy. Table changes must be requested if necessary. This was crystal-clear in my last casino session, but my online and home game results were backing it up. I was back to a steady upwards graph online having firmly dropped to 10NL, a much weaker field than at the 25NL where I felt like I was training for $1/$2 live. I continued to win money steadily against a much softer field in the .25/.50 home game I ran. Clearly, game selection was working for me there. What I was losing was the experience and skill gained from facing opponents who were as skilled or more skilled than me. There will be a time in my poker life where I will want to get back to doing that. Hell, when I play versus Red Chip members and coaches at our annual Vegas meetup this year, I’m going to be surrounded by poker talent that dwarfs mine. That’s enough lack of game selection for the rest of the year. 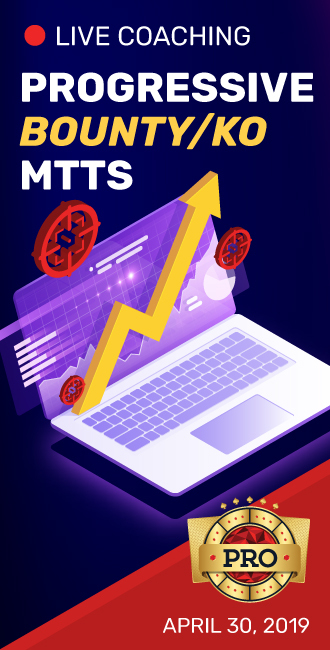 Right now, having dropped over $1,000 in the last two sessions, it was time to place long-term profit back in the forefront of the goal hierarchy. To that end, I’m way overdue to review progress toward the goal I set back in Strategy in Action #1, which was to build my bankroll to $6,000 (by winning $4,500 on top of the $1,500 I started my bankroll with) by November 9, 2017. Looking back on my writing around this goal in the early going, I realize I was incredibly naive of the swings that were likely, especially given I play on average one session per month. Even if I had been playing my A game at all times, I could have run much worse and lost much more. For now, I have 6 months left toward this goal, but I’m less that two buy-ins closer than when I started, in terms of results. In terms of poker skill and knowledge, I’ve come a long way. I am comfortably winning the much smaller stakes I choose to play online and in my home game, and every $1/$2 game is technically something of a shot I’m taking. Winning 12 buy-ins at $1/$2 in 6 months is a very tall order, given my results and my average of one session per month. I would need to game select only the softest tables, play longer sessions, and run good overall to hit that mark. I am not quite to the point where I feel like I need to adjust my goal. The fact that it feels a bit out of reach is not necessarily a bad thing as I struggle with building the discipline needed to approach the game like a professional, and select only the most profitable games to play in. One thing I need to do a better job of is integrating the materials I’m studying into these articles. The truth is that I have been studying PRO videos very little, because I’ve been getting great coaching via podcast interviews, reading books, and talking with coaches outside of these interviews as well. C-betting and hand reading are two areas I’ve been working on a lot, but I haven’t been studying by applying myself, I’ve just been absorbing information. I’m sure many of you can relate — you have enough time to watch a poker video, not enough time to sit down for two hours working it out in software or on paper before bringing it to the tables. Another thing I want to change is to talk more about my online and home game experience and results, and perhaps look at it all as part of one big poker bankroll along with my casino winnings. This gives me more ways to profit toward my goal, but it’s also a more accurate representation of my poker experience. I’ve resisted this so far to stay focused on beating $1/$2 as a topic, because I know that’s what a lot of you are trying to do. But I also know that many of you are playing online and in home games like me, if only because they are convenient and profitable methods of developing poker skills to apply at $1/$2. I also must admit that I’ve had a growing interest in playing more tournaments. Perhaps it’s the WSOP coming up, perhaps it’s a little bit of cash game burnout, particularly after losing so many buy-ins. I do love tournament poker, and though I started as and always will be primarily a cash game player, I can’t resist tournaments when I have the time. I enjoy them at home games and in the casino, but online will always be the tournament spot for me. I love everything from heads-up sit-and-gos to O8 MTTs. I miss playing tournaments and getting back into them is not a question of if but when. And not incidentally, I think tournaments are going to increase in popularity, as they lend themselves perfectly to social media, where fans and followers can cheer along in real-time as you run deep, or share in the bummer of a bust. The poker world is rapidly changing, and I always want to be where the interest is. Right now we are seeing live $1/$2 NL thriving across the country. I see tournaments both live and online following the same trajectory as social media shapes the next generation of poker. How about you? What would you like to see more of in these episodes? Let me know in the comments, your feedback is always welcome. Until next time, thanks for following along! What’s wrong with raising 2.5x as an open preflop? I play online tournaments but is that such an error in live cash? I didn’t think it was from what I’ve heard. What sizing do you use? In online tournaments, the standard open size is much smaller than live low-stakes cash. At live $1/$2 I open for $12 + $2 for each limper, generally rounded up to the nearest $5 increment. This is what it takes to put most opponents to a difficult decision and get them to fold a good chunk of their range. Of course, they will adjust and start to call your raises wider, at which point I make sure to assign them a wider range. Better players tend to notice I am pushing for the pain threshold and will call wider, especially in position, or even 3-bet. So there are numerous adjustments to make and SplitSuit just did a great podcast on adjusting bet size. I’m not much of a regular online tournament player but when I do play, I definitely open to more like 2.5x-3x. Ha, I will not argue with you there. They do have a 2-story colorful banner hung out of frame to the left, but it’s overall the most dreary casino on the outside that I’ve ever seen on the East Coast. Inside it’s a typical if small casino, it’s got the only poker room I can remember that has a big window to look out of. Too bad all you see is the parking lot and the depressed city of Schenectady. So far I’ve found the poker room to be nice and well-run. The floor has been very helpful and accommodating, even when they’re busy. But yeah, the outside could use some work. I’m not going to lie – as a 1/2 NL rec player / fish, I have never table changed in my life. I’m not even sure I really understand how it “works”. You ask for a table change, they give you the “table change” button/chip then . . .
eventually a seat opens on some random “other” table that is playing the same stakes and they move you there instead of seating someone from the list (who presumably gets your seat) ? can you refuse a move to a “worse” table and hold out for a “better” one? or would you lose your chance? and how would I know if the table they are moving me to is any better (or worse!) than the one I am sitting at?